Modern spacious 2 bedroom house in a beautiful tree lined street in Richmond. Walking distance to parks, cafes, pubs, trams, trains and the Yarra River. The MCG, Rod Laver Arena, AAMI park and the CBD are a short tram ride away. You will love a full size kitchen, dining area, 2 large bedrooms, brand new bathroom and the sun filled courtyard for those perfect afternoons. It is everything you need for a true Melbourne experience. It is the ideal place for couples, business and families. In one of Richmond's most sought after streets. It's a true home away from home. Within a short distance is shopping, entertainment, footy, dining and other sports. This beautifully presented, clean and spacious house has 2 large bedrooms, Wifi, 50 inch LCD smart TV with Netflix, Air Conditioning, 2 couches, a dining table that comfortably accommodates 6, a fully equipped kitchen, modern new bathroom and a sun filled courtyard with BBQ. You wont be disappointed. and Netflix for all your movie needs. There is a parking permit available for use for street parking. Porta Cot and high chair can be supplied on request. Your basic condiments ie: coffee, tea, sugar, oil also supplied. House is close to public transport with a 2 minute walk to the closest tram and 5 minute walk to the train station. Richmond is a vibrant exciting inner suburb of Melbourne. Whether you are here for the footy at the MCG, the soccer or rugby at AAMI park, a show or the tennis at Rod Laver Arena, business or just the dining and shopping experience it is all just a stones throw away. There is plenty of amazing cafes, restaurants, bars and pubs all within walking distance. Whether you choose to stay in and enjoy cooking up a feast and a glass of wine or head out to the many eateries nearby you will not be disappointed with this house or location. Public transport is incredible close and easy to use. It's a 2 minute walk to the Swan Street Tram, 5 minute walk to Burnley Railway Station and 8 minute walk to Bridge Road Tram. Both taxi's and Uber is easily accessible. Should you have a car there is a parking permit available for use in the permit street parking. For those travelling with Children, Burnley Park playground and parkland is 100 meters away. The Yarra River is a short walk and has a fantastic bike track that can take you either into Federation Square, the CBD or head the other way towards the Collingwood Children's Farm and the beautiful Dights Falls. Permit provided for on street parking. Coffee, coffee pods, tea, sugar, milk, oil, salt, pepper, margarine and other assorted items. Had a fabulous stay. Was the perfect place to come home to each night, convenient shops and cafes. Loved the leisurely walk into town. Can’t soeak highly enough of Monique and all her support and recommendations whilst our Father was in hospital, perfect. We were delighted by the house from the moment we stepped in the door and were very comfortable for our week's stay in Melbourne. It was spacious, fresh and spotlessly clean, both bedrooms are very roomy. Monique provided lots of useful information about the local area. It was really easy to travel either by tram or train into the city - both a short walk from the house. 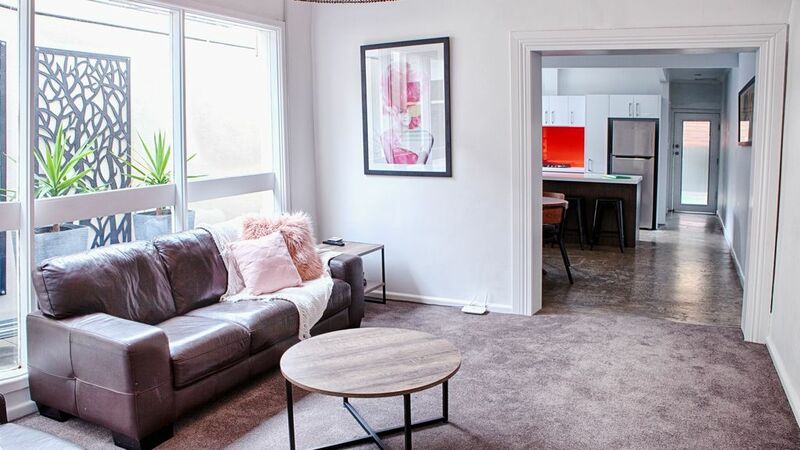 Located on the Burnley side of Richmond with good access to local cafes (2 across the road), easy access to trams/trains and 15min walk to the heart of Richmond. Couldn't ask for anything more from the host or from the property. Everything well appointed and modern. Fantastic home in a perfect spot! Thank you so much for our recent stay, we found it a perfect Melbourne get away spot and look forward to coming back again! Modern space that was perfect for relaxing after a day of shopping and exploring the city! This house included everything we needed for our short stay in Melbourne. It is located in the perfect spot with short walks to cafes and trams so it is easy to enjoy what Melbourne has to offer.